Let’s go back to January 23, 1884, New York City, 11 East Thirty-sixth St., the date and place of the founding of the Grolier Club. Was the night dark and stormy or was the moon brilliant and sky clear when the nine founding members first met at the home of legendary bibliophile, Robert Hoe? No matter, they all made it, conviviality filled the air, a common cause bonded them, and the Hoe library, including a plethora of rarities in many fields, provided pleasant distraction. These nine founders were a mix of book collectors, printers, and men interested in graphic arts. Their names are now listed on a panel just inside the entrance to the Club: William Loring Andrews, Theodore Low De Vinne, Alexander W. Drake, Albert Gallup, Robert Hoe, Jr., Brayton Ives, Samuel W. Marvin, Edward S. Mead, and Arthur B. Turnure. The distractions of Hoe’s library must have been temporary and their focus high because less than two weeks later, on February 5th, the men met again and established not only the club name but a constitution and elected officers. Two founders played an integral part in the story of the booklet. The first, Arthur Turnure (1857-1906), deserves more recognition than he’s received for his role in establishing the Club. A graduate of Princeton and newly minted lawyer, he practiced law in New York for a short time until he changed professions and became an art director at Harper & Brothers. Follow your passion. His magazine The Art Age established in 1883 was devoted to the printing arts. Around this time Turnure was a primary catalyst in coming up with the idea of the Grolier Club itself. W. G. Bowdoin wrote in his essay “The Gilliss Press” first published in the New York Times and reprinted in The American Printer and Lithographer (Vol. 37, Sept. 1903), “It was while in conference with the printers regarding the development of The Art Age that the advantages of a club or association having in view the promotion of the bookmaking arts was frequently mentioned by Mr. Turnure. The idea later found expression in The Grolier Club, the influence of which has been far reaching and of which Mr. Turnure was one of the incorporators, and the first secretary." Turnure lived literally across the street from Robert Hoe according to John Winterich in The Grolier Club 1884-1967: An Informal History (1967). It is not a big leap to conjecture that the young Turnure sought out his illustrious neighbor Hoe to discuss details involving the establishment of a club. Hoe agreed to host the preliminary meeting with Turnure doing the organizing. Turnure sent out the invitations for the meeting and his energy sparked an enthusiastic response. He would maintain his close involvement with the Club until he died prematurely of pneumonia at the age of 49. 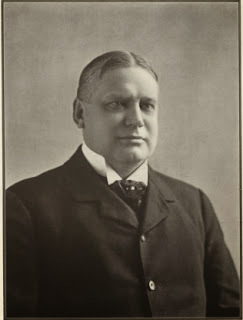 The second, William Loring Andrews (1837-1920), a dedicated bibliophile and connoisseur of the book arts, was also prominent in the early formation of the Club. Among many duties he served on the first publications committee. He would become well known as the author of a number of books about books finely printed in small editions including his own biographical essay of Grolier, Jean Grolier de Servier. . .Some Account of His Life and of His Famous Library (1892), Gossip about Book Collecting (1900) and Bibliopegy in the United States and Kindred Subjects (1902). The text of the Jean Grolier booklet appeared in print three times in 1884-1885. It was published as a magazine essay in the March 1884 issue of Turnure’s The Art Age. The author, identified as “C.A.” in the booklet, was Charlotte Adams, a regular contributor of diverse essays to various magazines including Harper’s New Monthly. Turnure may have known Charlotte Adams via his work at Harper & Brothers. If he commissioned her to write the essay for The Art Age that would have dovetailed nicely with his direct promotion of the newly established Club. The second appearance of the essay was in the booklet form being discussed. The third and last appearance, with a mildly revised text adding a bibliography, was in the 1885 Transactions of the Grolier Club. The format of the booklet in size and arrangement matches the 1884 “Year Book” Grolier Club: Constitution, Officers, By Laws, Members. This title also vies for the the first publication of the Grolier Club. The first issue of the Year Book contained the names of only 27 members and appears to have been printed no later than March or April of 1884. (Winterich notes, “Before the summer of 1884 arrived, sixty-five names were on the [membership] list.”) The printed memorandum slip tipped into the first issue reads, “Since this issue went to press, many members have been added whose names will be included on a supplementary list.” The second issue of the 1884 Year Book incorporates two additional pages of members and records that the Club’s membership limit has been increased from fifty to one hundred. Although our Jean Grolier booklet and the Year Book bear no imprint it is almost certain both were printed by the Gilliss Brothers, New York printers. Turnure was a partner with the Gilliss Brothers. William Loring Andrews also utilized them regularly for various projects. The Gilliss Brothers printed Turnure’s The Art Age that contained the Jean Grolier essay. They were also responsible for printing the 1885 Transactions volume with the Jean Grolier essay under Turnure’s joint imprint of “The Art Age Press” along with other early Grolier Club publications. So far, so good. We have an author of the booklet, a probable printer, and we’ve identified the text’s three appearances. We’ve also shown the booklet’s close relationship in format and size to the 1884 Year Book. But exactly why and when was the booklet version produced? Adolph Growoll gives a clue to the why in American Book Clubs: Their Beginnings and History, and a Bibliography of Their Publications (1897) citing the booklet in his list of Grolier Club publications categorizing it under, “Books Printed in Very Limited Numbers for Special Use, But Never Published.” Another clue surfaced recently while I was perusing an old auction catalogue in my bookroom during halftime of a football game. Multi-tasking. The auction consisted of books from the library of Miss Dorothy Furman sold in New York at the Walpole Galleries, July 1 & 2, 1920. Furman had a fine run of William Loring Andrews publications, most inscribed to her with correspondence laid in. Listed under these Andrews books was the Jean Grolier booklet (lot 23) described as “privately printed by W. L. Andrews, without place or date.” A serendipitous discovery—I almost knocked over my bowl of chips--and the spur for this essay. It is the only auction citation to the booklet I’ve found. Grouping it with the extensive list of other Andrews items was certainly not a random act. It also makes sense. Within a few months of the Club’s formation the membership had swelled to approximately fifty members and would reach about one hundred within the first year. Many of these early members and potential members would not have known much about the Club’s namesake, Jean Grolier. For example, The Critic magazine of March 15, 1884, described the newly formed Grolier Club and then recommended, “Those to whom Grolier is but a name will find an interesting article by Miss Charlotte Adams giving a sketch of his life and famous library, in The Art Age for March.” It would have been unwieldy to hand a curious potential member a full issue of Turnure’s The Art Age to read the Grolier article. A separate booklet of the essay “printed in very limited numbers for special use” would have come in handy. A conversation between Andrews and Turnure (and perhaps other founders), along with a modest monetary commitment by Andrews and the production of the booklet was simple enough. I believe the booklet’s printing dates from shortly after this council meeting, either late March or early April 1884. The March 17th minutes officially put the stamp of approval on the publication committee’s plan to print the booklet. The timing coincides with the printing of the first issue of the Year Book in the same format. It also coincides with the essay’s magazine publication and a need for a separate. If the booklet is not being referred to in the minutes of March 17th then what Jean Grolier publication is being authorized? Actually, the evidence indicates this November 6 resolution is not referring to the “little booklet” which had already been printed months before. I suggest the “Club book” cited isn’t the 1884 Year Book but instead the 1885 Transactions of the Grolier Club, a large 8vo in size with no similarity in format to the booklet. What was proposed to be “prepared and printed uniform with the Club book and to be ultimately bound with it” was the version of the essay found in the 1885 Transactions of the Grolier Club. In this scenario, the publication in early 1885 of the Transactions volume in an edition of 740 copies would have negated the need for the proposed separate edition of 250 copies cited in the November 6 minutes. The evidence then supports the theory that this unassuming booklet, sketching the life and deeds of the Grolier Club’s namesake, was produced many months before the first official publication. However, the booklet was not formally published and it is clear that the founders considered A Decree of the Star Chamber Concerning Printing the first official work of the Club. We won’t quibble with them over their intent. I would lobby for a more prominent place of the booklet in the Grolier Club pantheon given its subject matter and publication history. I might also suggest a bibliographic roundtable with the founders to discuss the strictly chronological priority of both Jean Grolier and the 1884 Year Book. Alas, that must remain an imaginative encounter—one that I’ll begin right now as I sip a spiced Christmas ale in my library surrounded by haphazard stacks of books that really do need sorting. C[harlotte] A[dams]. JEAN GROLIER [cover title]. [New York: The Gilliss Press for William Loring Andrews / Grolier Club Publications Committee, March or April 1884?]. 14 p. 16mo. Cream printed wrappers. 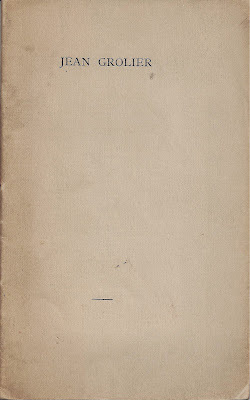 The front cover is incorporated into the pagination [pp. 1-2]. TEXT UPDATED 12/24/13 with information from Walter Gilliss's Recollections of the Gilliss Press (1926). There are a number of sources for additional info. 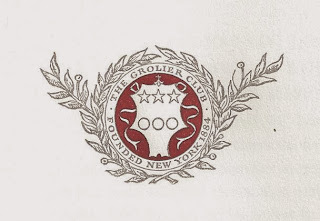 about the Grolier Club. Start with their website www.grolierclub.org. John Winterich’s The Grolier Club, 1884-1967: An Informal History (1967) remains a good read about the early days with brief biographical notes about the founders. Information about Turnure, Andrews, the Gillis Brothers, and The Art Age is available in various tidbits online, some of which would have been exceedingly difficult to locate in the pre-Internet days. If someone desires particulars contact me for details. Walter Gilliss's Recollections of the Gilliss Press and Its Work During Fifty years 1869-1919. (NY: The Grolier Club, 1926) is another essential resource. I have not yet been able to examine a run of Turnure’s The Art Age and am eager to do so. A chance to dig in the Grolier Club archives would certainly allow me to expand upon my preliminary outline and perhaps result in revisions. I hope to do this in the future.